Sun-dried tomato and pesto tuna cakes are a flavorful, healthy meal that comes together in just about 30 minutes – a great weeknight dinner recipe! 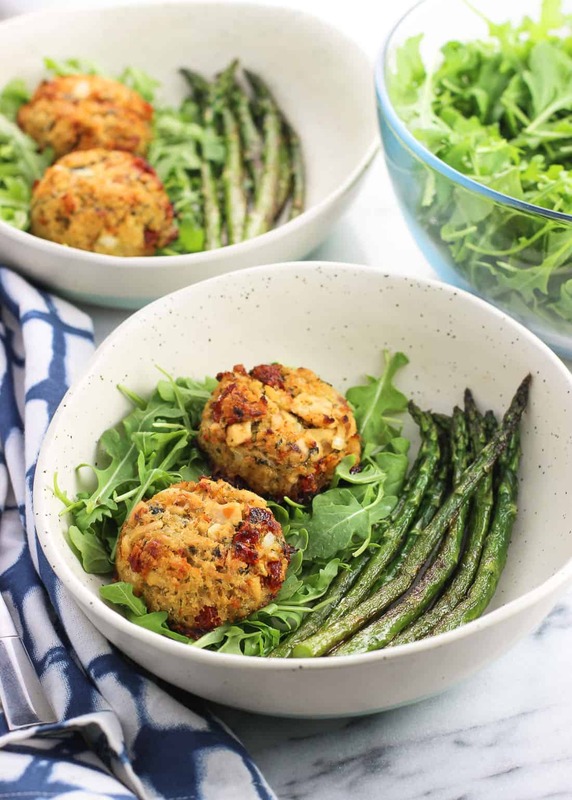 These tuna cakes are baked and served over a bed of arugula and alongside easy pan-roasted asparagus. Hello, spring! ☀️ I know it’s been springtime here in the Northern Hemisphere for a few weeks now, but we seem to have gotten over the hump of last minute freezes and grabbing coats back out of closets on chilly mornings. Fingers crossed it stays that way! My herb garden is planted, and I can’t seem to drive past a garden center (or supermarket, or home improvement store…) without bringing home a plant friend or two. 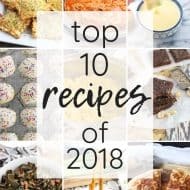 As if quick weeknight dinner recipes weren’t already top of the list in my house, they’re especially valuable now seeing as all I want to do in the evenings is walk around outside and obsess over the garden. This recipe for Sun-Dried Tomato and Pesto Tuna Cakes, made with Wild Selections® Solid White Albacore Tuna in Olive Oil fits the bill. 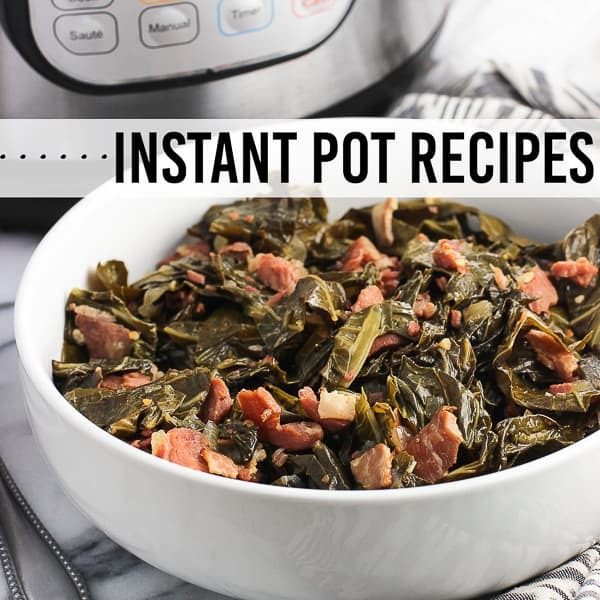 It’s a healthy and flavorful main dish recipe that’s good for both you and the environment. With Earth Day coming up (April 22nd! ), there couldn’t be better timing to talk about ways in which we all can become more mindful of our impact on the environment with our cooking and eating habits. 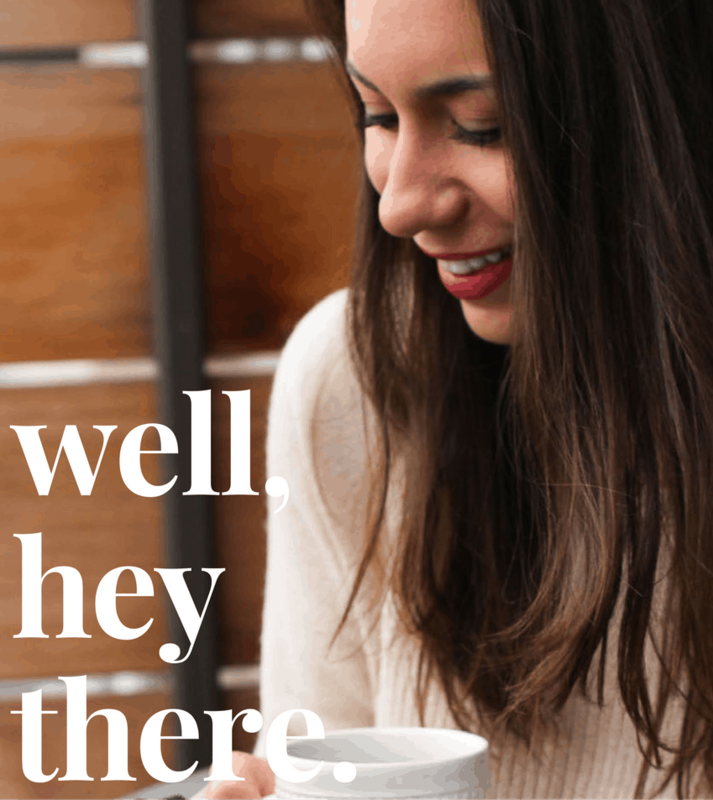 When I’m grocery shopping, I keep an eye out for brands that are committed to sustainable practices. 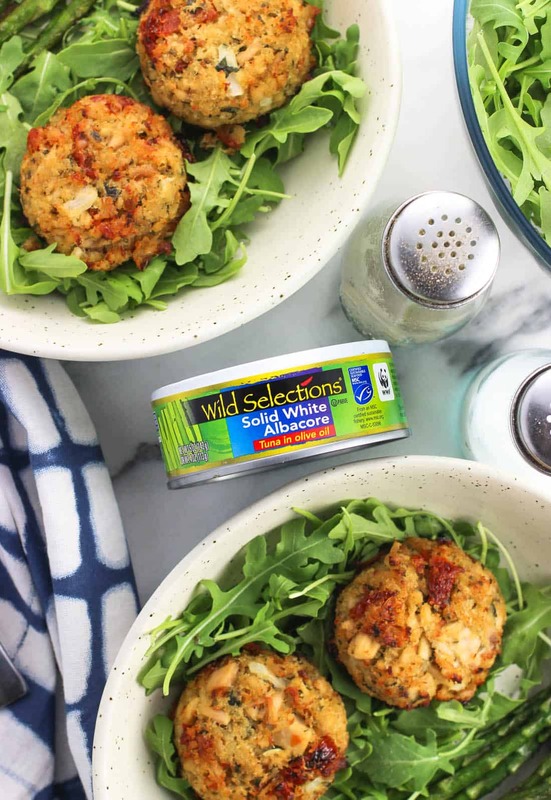 Wild Selections® is the only full line of Marine Stewardship Council (MSC) certified sustainable seafood, which you can see by peeping the blue MSC eco-label on the can packaging. This means that their fish come from fisheries that are well-managed and have healthy fish stocks. Wild Selections® also donates 13 cents from each can sold (a total of $1 million by 2018) to the World Wildlife Fund marine conservation and fishery improvement projects, helping to ensure a fish-full future. They’re focused on providing premium-quality, sustainably-sourced fish that’s 100% traceable – just visit the Wild Selections® website to find out where the fish in your can was caught. Mine comes from the Fiji Albacore Longline Fishery. Plus all tuna is Non-GMO Project Verified, rounding out the simple, all-natural ingredients used in their products. All of these qualities make Wild Selections® an easy choice for me when it comes to fish. 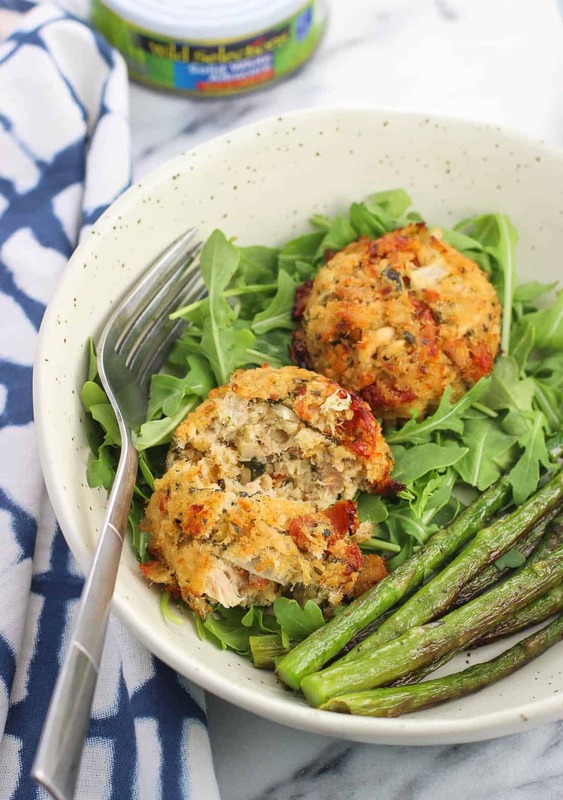 While Wild Selections® Solid White Albacore Tuna in Olive Oil is the shining star of this Sun-Dried Tomato and Pesto Tuna Cakes recipe, a few additional ingredients bring a bold flavor and help form the perfect consistency. For the ‘pesto’ part, I scaled way down my go-to pesto sauce recipe and chopped everything up in the food processor. 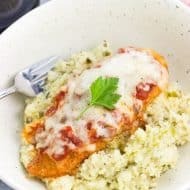 Since the quantity of pesto ingredients here is much smaller than it would be if you’re making a sauce, the pesto won’t become creamy, but will result in small basil pieces that are moistened with olive oil and evenly mixed with the garlic and Parmesan. 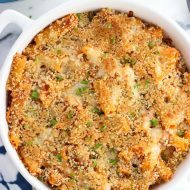 Add in a beaten egg for binding, panko breadcrumbs, diced onion, and sun-dried tomatoes and when combined with the tuna, you have a tuna cake mixture that holds together wonderfully and bakes up tender and moist. Just a minute or two under the broiler gives the tuna cakes their golden-brown color and crisp exterior, so please don’t skip that step! 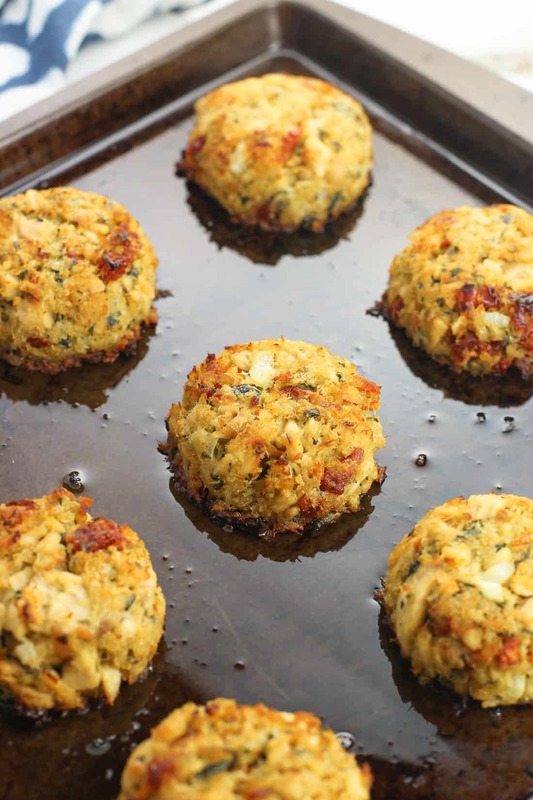 Another way we can reduce environmental impact with our cooking is when it comes to serving these sun-dried tomato and pesto tuna cakes. It’s a great practice to eat seasonal produce as much as possible, as these fruits and vegetables often require less fuel/energy/resources in order to make their way to your grocery store or market. I’ve also found these fruits and vegetables to be less expensive when they’re in season, which definitely sweetens the deal! 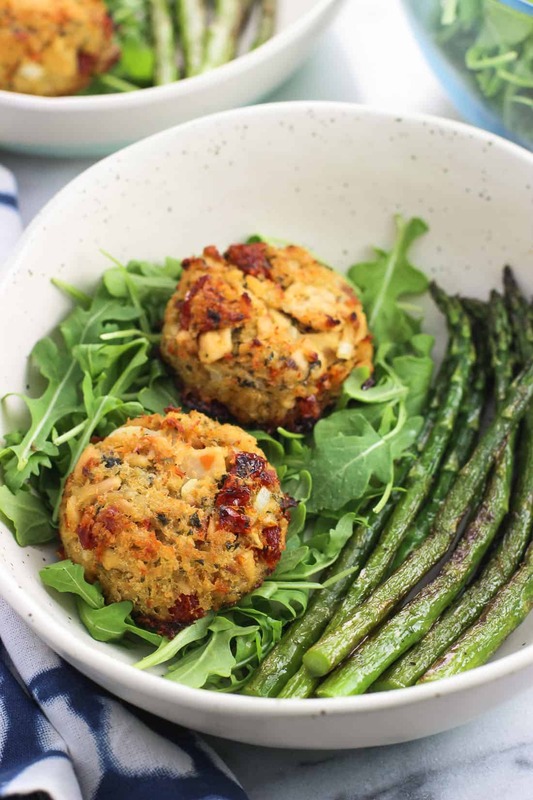 These tuna cakes are served with arugula and asparagus, two springtime seasonal vegetables. I’m all about the peppery flavor arugula provides a mixed greens salad, so using arugula greens by themselves in this recipe was a treat. And asparagus, my love. ♥ I’ve been picking up asparagus on nearly every shopping trip with the ‘excuse’ that it’s in season, so why not? I’ve grilled it, cooked in in the oven, and eaten it raw, but this stovetop pan-roasted asparagus was a great pairing for these tuna cakes. The asparagus cooks for just a few minutes in equal parts olive oil and butter, with only a sprinkling of salt and pepper needed for seasoning. This simple preparation allows the fresh taste of asparagus to come through. 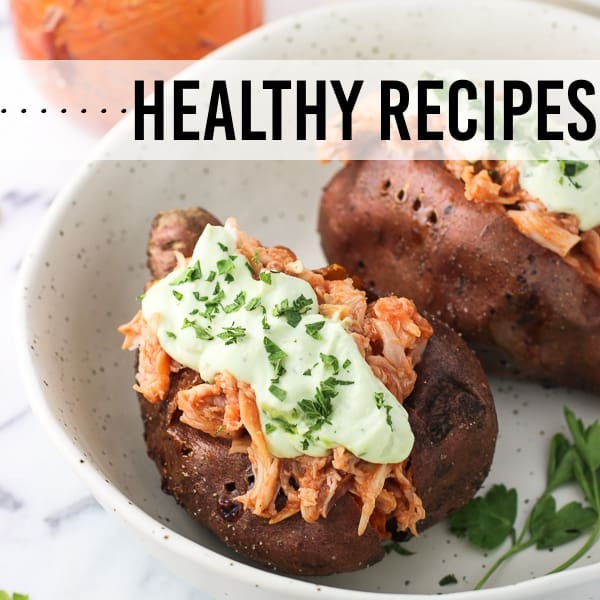 One other way to reduce environmental impact in the kitchen is to cook with leftovers in mind, as enjoying leftover portions of a recipe two or three or four times afterwards often uses less energy than prepping and cooking another meal from scratch. Using a quarter-cup measuring cup, this recipe will make about eleven tuna cakes. With two or so tuna cakes per portion, I’ve eaten this exact meal as written below again for next-day lunch, and have also made a tuna cake sandwich. 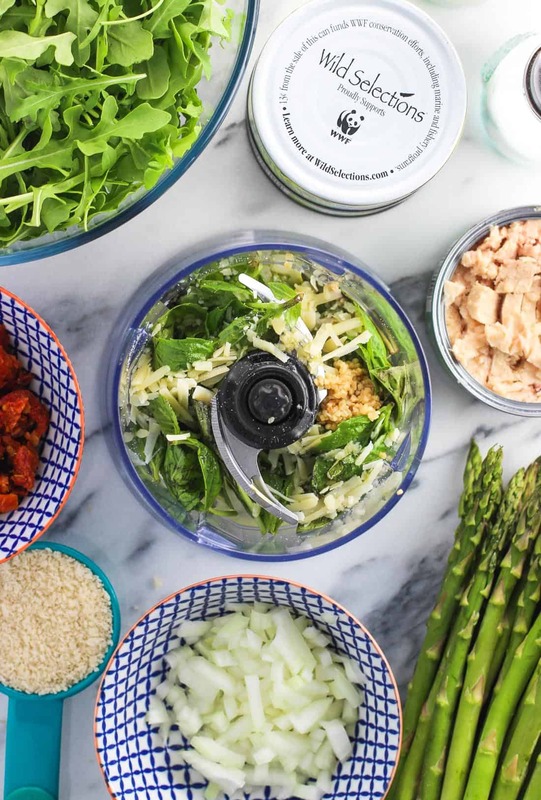 Whichever your preference, these sun-dried tomato and pesto tuna cakes are versatile and make an easy and healthy meal option you can feel good about. Sun-dried tomato and pesto tuna cakes are a flavorful, healthy meal that comes together quick enough for a weeknight dinner recipe. 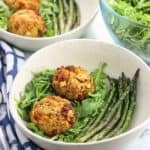 These tuna cakes are baked and served over a bed of arugula and alongside easy pan-roasted asparagus. Preheat oven to 400°F, situating one oven rack in the middle of the oven and one near the top. Lightly oil a baking sheet and set aside. 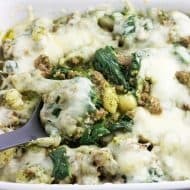 Add basil leaves, 2 cloves of garlic, 2 tbsp olive oil, and 1 tbsp of Parmesan cheese to a food processor and pulse until basil leaves are in small pieces and all ingredients are evenly distributed. It won't be creamy or liquidy. Beat egg in a mixing bowl. Add basil mixture and whisk to combine. Add panko and sun-dried tomatoes and stir. Fold in tuna and onion until evenly mixed. 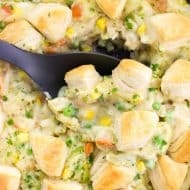 Using a one-quarter cup measuring cup, scoop tuna mixture into the cup and pack it in tightly with the back of a spoon. Invert cup onto the prepared baking sheet and lightly tap the bottom of the cup to release the tuna cake. 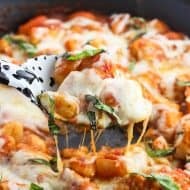 They should hold their shape very well, but press back in any loose ingredients if they separate. Repeat for the remaining mixture (you should yield about 11 tuna cakes). Place tuna cakes in the oven on the middle rack and bake for 10 minutes. Once done, move the baking sheet to the upper rack and set the oven to broil. Let tuna cakes broil for a minute or two, keeping a constant eye on them to ensure they don't burn. Once the tuna cakes have browned, remove from oven and let them cool slightly on the sheet before removing. Swirl together olive oil and butter in a large saucepan set over medium to medium-high heat. Once melted, add asparagus in a single layer. Sprinkle salt and pepper over top. Every few minutes, turn asparagus so that all sides cook evenly. Remove from heat once done. To serve, place two tuna cakes over a bed of arugula and serve alongside the asparagus. Drizzle arugula with balsamic vinaigrette if you prefer. I used sun-dried tomatoes that have been packed in oil. Would these freeze well before cooking? I have done this with other tuna cakes and it has worked well. Thanks! They sound great! HEAVEN! Heaven I tell you. I don’t think I would be able to stop myself at just 2 though. 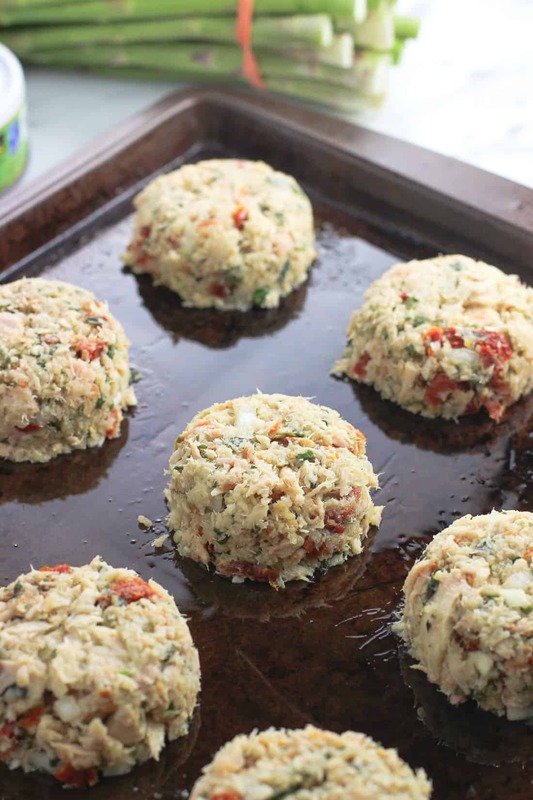 These tuna cakes look so good Alyssa — I love that you added pesto and sun dried tomatoes! Wild Selections sounds like a great brand too — I love that they’re giving back! 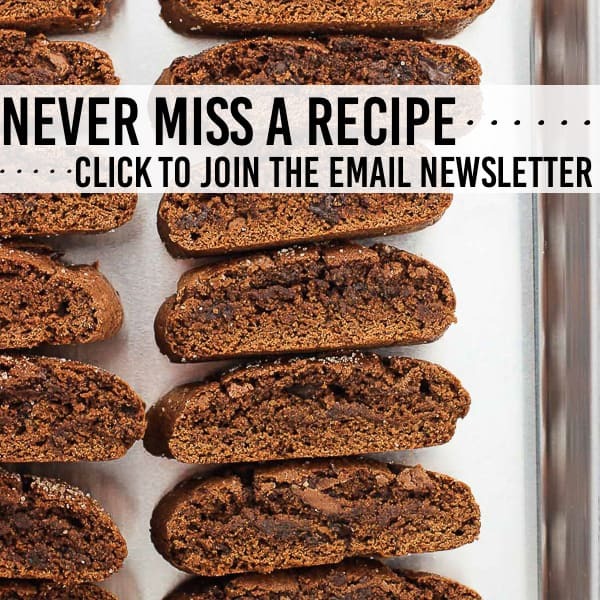 Ok I am HOOKED on this recipe, Alyssa! I love it! I always have tuna stashed in my pantry, so this sounds like such a fun way to make use of it. And those flavors! Loving the pesto and sun-dried tomato. My kind of tuna meal!